Halloween Will Never be the Same! 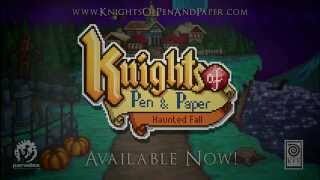 Knights of Pen & Paper: Haunted Fall expands on the unmistakable charm and wit of the original game with more enemies, more epic quest and more locations in a spine tingling Halloween setting. Navigate an engrossing new quest line where you square off against unruly Jack o Lanterns, wobbly undead and a mish mash of bewildered monsters. Halloween will never be the same again! This content requires the base game Knights of Pen and Paper on Steam in order to play.